How Magnetic Brooms Protect Your Business From Tramp Metals | IPES International, Inc. If you’re in the middle of a mining project, tramp metal can cause big problems for you. Tramp metal is any metallic scrap that’s able to work its way onto a conveyor while mining is taking place. Some common examples of tramp metal include bore crown, chains, bucket teeth, bar scrap, and even tools. You want to eliminate as much tramp metal from a job site as you can while mining. Tramp metal is bad because it can do a lot of damage to the equipment that you typically use when mining. It can force you to shut down things like crushers, conveyors, and more if you don’t catch the tramp metal before it works its way through them. You can lose time and money during a mining job due to the presence of tramp metal. Fortunately, you don’t have to let tramp metal get in your way when you’re mining. There are actually tools you can use to find and remove tramp metal from a worksite quickly. 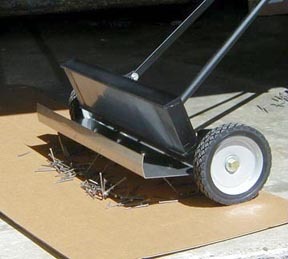 A Deluxe Magnetic Rolling Sweeper from IPES International, for example, is a relatively simple and straightforward tool that you can utilize to stop tramp metal from damaging your pricier equipment. It’ll sift through the toughest of terrains and pick up stray metals that might otherwise go unnoticed. This will make it easy for you to find and discard tramp metal before you start mining. Is tramp metal something that’s a cause for concern on your current job site? Rather than putting your equipment at risk, call IPES International at 412-781-4660 today to get your hands on the tools you’ll need to make tramp metal a distant memory. You can use them to start managing your tramp metal more effectively so that you can complete mining jobs without worrying about it.